(Loot) Paytm 10 pe 100 Gold Offer – Get Rs 100 Cashback on Making 10 Gold Purchase worth Rs 100 Each. Paytm has come up with an awesome deal where you will get the Rs 100 Cashback on Purchase of Gold 10 Times worth Rs 100 each time. You can avail this offer a maximum of 1 time during the campaign validity. So Hurry up and avail this offer now !! 11. Now You have to made 1 Gold transaction per month (Not eligible more than 1 purchase per month). 12. You can avail this offer Maximum 1 time during the offer period. New Terms:- Only one Gold purchase per month will be counted for this offer. * User needs to buy gold worth Rs 100 or more 10 times to get Rs 100 cashback. What about selling? How much profit/loss? Yash bro your comment section time is running 6 hour late. Means now its 11:49 pm and at the same time we post any comment, the posted comment time shows 05:49 pm. Yes, we know that. I can fix it within a minute, But can’t do as it will my change other features which is dependable in this time zone. Its waste if time…when I sold 100 Rs gold I get only 93 Rs. So for 1000 Rs we get only 930 Rs + 100(cashback) . So net profit is 30 Rs. Hey bro, I tried to add money to my ABPB using DBS Digibank (rs 9999).. the transaction was successful.. money debited from Digibank nut not credited to ABPB.. it’s been 4 days i neither got refund not the money added to ABPB.. What should I do now?? I’m little bit worried.. only positive thing is DIGIBANK is super helpful.. Contact with ABPB with UPI Reference number. What will happen if I am non kyc. user?How to use cahsback for non kyc user? 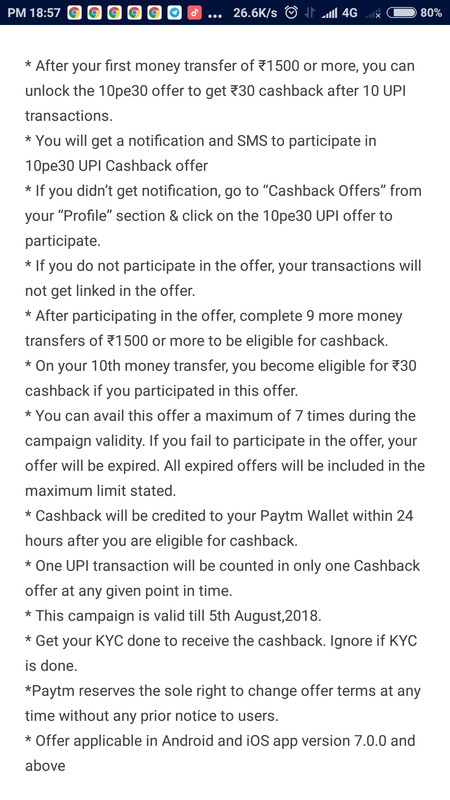 You cashback will be pending..
Also Paytm stopped its KYC process (almost 25 days gone). I lost 65 rs in form of gst for 10 transaction and not receive any cash back and as per paytm u have to do only one transaction per month .so it will need 10 month for 35 rs. U not update full t&c of this offer.read t&c once again .I do first transaction and recive sms that u successfully active offer but for another 9 transaction no one was counted at it one transaction per month only counted. Where is written about 1 transaction per month? Please wait 2-3 days for your Cashback! Got it. But its completely Paytm fault not Mine. They changed the Offer without any prior notice. See Old T&C in our Post and New T&C updated at Paytm App. We have screenshot of old T&C too. Its your Responsibility to Check the Offer before using! That’s why we include Offer Source link in most of the Posts! Now TnC changed to one transaction a month and should do 10 transactions in 12 months to get Rs.100 cashback. Bro you need to participate in this offer. After your first purchase of gold go to cashbacks section and participate in this offer and then purchase gold for 9 times. I guess you missed this part. Read 2nd point in Paytm app.